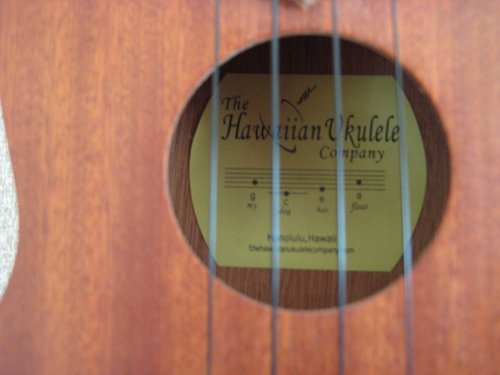 The Hawaiian Ukulele Company is a ukulele store based in Oahu. For the most part, they sell ukuleles made by other Hawaiian companies (such as KoAloha and Sonny D). They do have one ukulele they make themselves; the Original uke. You can buy one on their website. This is a good uke that seems well built and sounds great. It was purchased as my first ‘real ukulele’ on my second trip to Hawaii. Still being a uke n00b I was still not knowledgeable about ukulele purchasing but managed much better this time around. Overall, it is a great beginner’s uke. The ukulele looks great and feels good and sturdy in the hands. It is all Mahogany wood and has a nice finish on it. 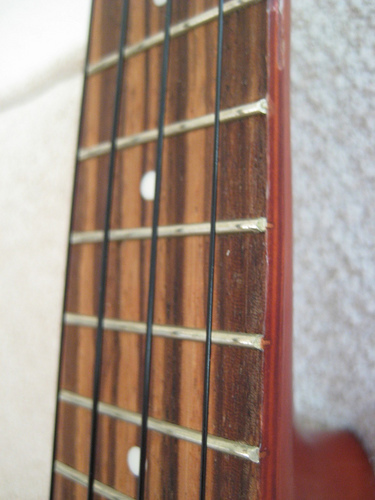 The fretboard is solid wood with metal and I think plastic inlays. The bridge is made of untreated wood and plastic. I am not sure why the bridge is left raw like that. It seems odd to me but it does not effect the quality. The keys are nice and sturdy metal and plastic and feel good to tune. The entire structure is heavier than you would think, but gives it a feeling of quality. This ukulele sounds great and is a joy to play. The scale is relatively low topping out at 15 frets, making some songs almost impossible to play. I got the “Starter’s kit” that came with a hard case and a pipe tuner (I missed out on the book). The hard case is great quality and protects the uke well. 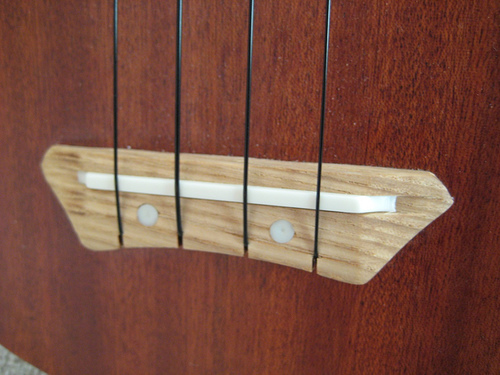 I have found it easier to use online uke tuners over the pipe tuner but that may just be my bad pitch. It has been a great uke to discover the world of ukulele with and ignites the desire for a better instrument without being a let down. A fantastic beginner’s uke. Buy one at the Hawaiian Ukulele Company website. 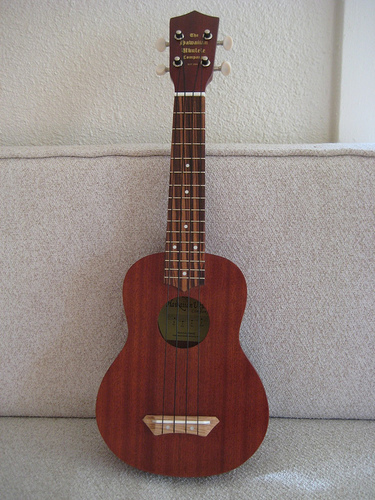 I have a ukulele from Universal Worldwide Trading Inc. It is just a toy ukulele, but it is great for beginners. It is from a small shop in Waikiki and can be purchased at almost any flea market there. It was very inexpensive (around $14.50) yet surprisingly nice. It is very easy to tune and seems to hold its tune for a long time. It is a very good instrument for anyone first learning to play. For those people who are not sure if they really want to learn to play the ukulele, it makes a great trial instrument because it is not expensive and still sounds great. However, after learning, most people will probably want to upgrade to a better instrument. It also is very pretty, which may or may not matter. It is dark-colored with surf boards, flowers, and the words Hawaii and Aloha. It seems to be wooden, but it may be fake. Overall, I was very pleased with this instrument and still have it. for then knows what they are doing. Holds tune for a looong time. Sound is pure Hawaiian. Looks are very good. You will be proud to own one. 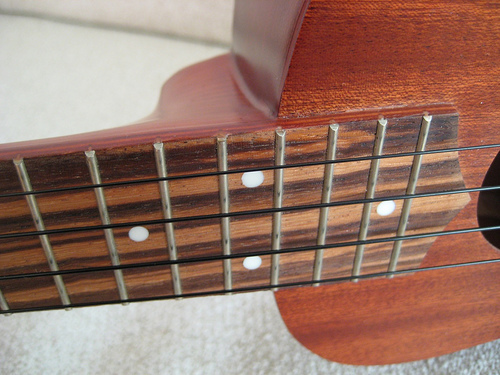 I’m looking at a Hawaii Kai hc-40 used ukulele. I do not see this brand on the list. Any input on this uke? Thanks. I learned to play the uke 2 yrs ago on a cruise ship to hawaii and own two so far (one is a beautiful black Leolani, set higher than I like but with great tuning gears and decent sound). I bought a second uke, Hawaiian Uke Co soprano for $45. This has excellent tuning gears and can hold the tune for over a month in room temperature. It is set low so it plays really well and has a more solid sound. There’s a slight hum on the E and clarity diminishes on frets closer to the body. I’ve traveled to Europe with this uke and is my choice of uke. I just ordered a Luna Great Wave concert uke for xmas. Will let you know how that plays when I get it. 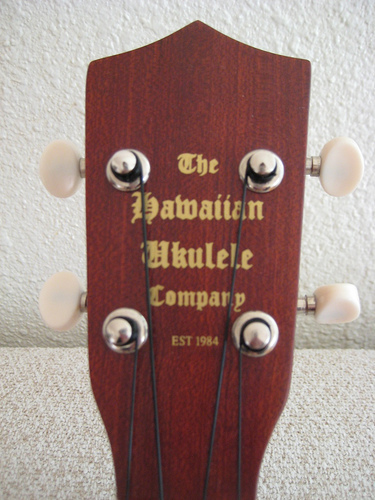 But the Hawaiian Company uke is a very good one for the price. i have this uke and is a joy to play !! it gets a work out once a day whether it likes it or not ! !